EDF Renewables is a pioneer and a major player in onshore and offshore wind energy in France and around the world. Onshore wind, our traditional business activity, has been our main growth driver for the past 15 years. We develop and operate wind farms in 18 countries. Project quality is determined during the development phase, which can last several years. EDF Renewables builds on consultations to develop projects in the interest of local authorities. EDF Renewables works with leading partners to install state-of-the-art wind turbines and guarantee strong energy performance while blending the turbines into the landscape. Onshore wind is now a mature segment, recognised as a reliable and competitive source of energy. Technical progress is driving the development of increasingly efficient equipment and lowering production costs. The cost of onshore wind turbines has, for example, been cut by 40% since 2010. At the same time, wind capacity worldwide increased nearly tenfold between 2004 and 2016 from 48 GW to 467 GW at the end of 2016 (source: management report). Since 2001 EDF Renewables has steadily expanded in these two geographical areas. The largest EDF Renewables wind farm in France. It is equipped with “stealth blade” technology, the world’s first solution supporting the coexistence of wind turbines and weather radar. 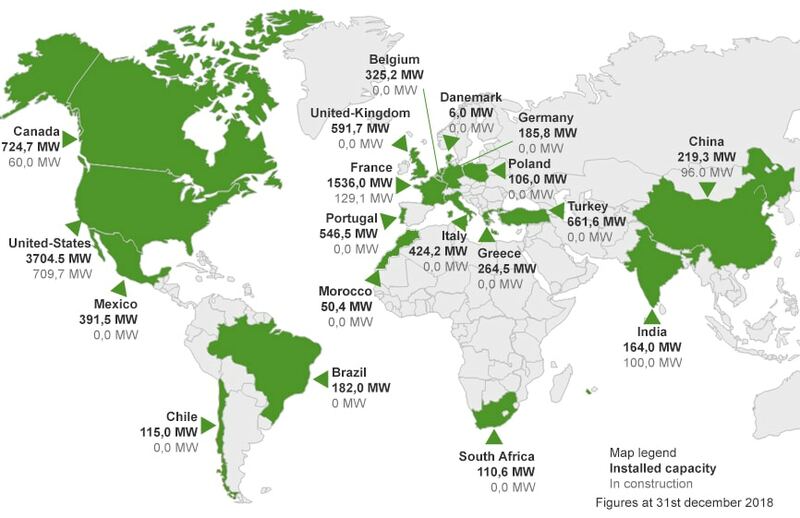 Over the past five years, EDF Renewables has built positions in additional markets – South Africa, Brazil, Chile, India and China – with 888 MW of capacity either installed or under construction. Expansion in these new markets demonstrates the momentum of EDF Renewables and reflects our ability to work closely with outstanding local partners. EDF Renewables seeks to innovate without interruption in order to improve the productivity and competitiveness of our assets. We have formed partnerships to develop several innovative technologies that address the technical obstacles faced by wind farms. This innovation, which enables wind turbines and radar systems to coexist, is now up and running. Based on a military technology derived from stealth fighter planes, stealth blades substantially mitigate problems of interference with radar. In a world first, the solution was installed on the turbines at the Ensemble Eolien Catalan wind farm in France, which is located 20 km from a weather radar station. This innovation will make it possible to issue several building permits that had been held up due to potential radar disturbance. In Quebec, the temperature frequently drops below freezing between September and May. This can sharply curtail the operation of wind farms, which have to be shut down when conditions become too extreme. To mitigate production losses due to frost, our Canadian subsidiary EDF EN Canada has developed a de-icing solution involving installation of heating elements on the blades that boosts the power available in the hub. The project is now being tested on two pilot turbines.